In the early days of Vajrayana few Tibetan Lamas visited Britain, and eager students were often prepared to travel considerable distances to receive instruction. Yet some sought out a young Englishman recently returned from the Himalayas. Inspired by the magic and mystery of Tibet, they were keen to discover the lived meaning. Ngakpa Chögyam’s teachings were simple, direct, and experiential. The four evening talks contained here deal with the themes studied by everyone exploring Buddhism in depth: the four noble truths, eightfold path, causality, compassion and refuge. This material is discussed in creative contemporary English, and presented from a perspective informed by Dzogchen. Rinpoche was first asked to teach by Gétsulma Tsültrim Zangmo, a Western nun whom Rinpoche named ’ö-Zér Nyima after she received Dzogchen transmissions from him. ’ö-Zér Nyima means Rays of the Sun and this book is dedicated to the memory of this extraordinary English woman. 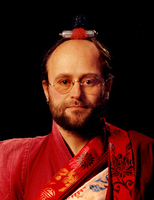 Ngakpa Chögyam is a poet, thangka painter, multitalented Vajrayana craftsman, and exponent of Yogic Song and Lama-dance. Ngakpa Chögyam is known particularly for his presentation of Dzogchen sem-dé and the Khandro Pawo Nyi-da Mélong Gyüd (mKha’ ’gro dPa bo nyi zLa me long rGyud), although he specialises in Dzogchen long-dé and Dzogchen men-ngag-dé with his personal students. Both Ngak’chang Rinpoche and Khandro Déchen teach mainly within the ethos of Dzogchen and enjoy cordial informal teaching scenarios with their apprentices in Britain and the USA.